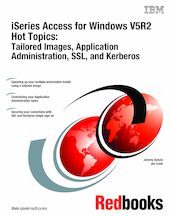 - iSeries Access for Windows functions using Kerberos and IBM Enterprise Identity Mapping (EIM) network authentication capabilities. This information has been updated to include examples of using EIM to map Kerberos principals to OS/400 users. This information should get you up and running quickly using these capabilities. The information in this book is generally available through sets of information located at the various iSeries Web sites, but is documented here all in one place and with actual examples.